College Coach? Click here to view all of Terra's information. 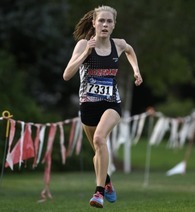 I started running cross country and track when I was in the 6th grade for the Bozeman Track Club. I discovered that I really loved to run, and I enjoyed making friends along the way. I'm now in my sixth year of running and I am a junior in high school. Cross country is by far my favorite activity and I love the team aspect of it. I look forward to running with my teammates this year and throughout the rest of high school and college. I also strive to do well in school and have maintained a 4.0. I think that running helps me balance my time and schoolwork well. I try to remain positive throughout track and cross country seasons for better outcomes in running and school. I look forward to my next season. Super muddy and rainy that day. Distance Running Camp for high school runners from all areas of the country. Runs were on trails in the surrounding mountain area.